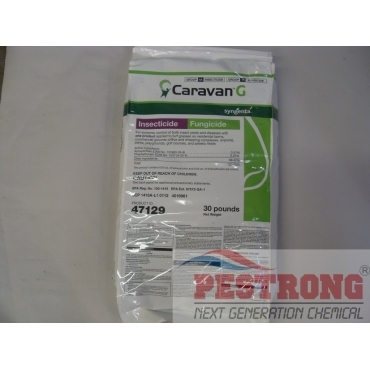 Where to Buy Caravan G Insecticide Fungicide, Caravan G Granular Insecticide Fungicide - 30 Lb - $89.95 for Sale with Fast Free Shipping! Caravan G Granular Insecticide Fungicide - 30 Lb controls insects as meridian and disease as heritage to deliver better looking turf. Caravan G insecticide fungicide is a broad-spectrum combination product delivering the disease control of Heritage G fungicide and the insect control of Meridian 25WG insecticide. Depending on application timing and geography, one application of Caravan G made between May 15 through July 15 can yield season-long grub control and up to one month preventive brown patch control. For additional disease control, follow-up applications can be made with Heritage G or Headway G fungicides as needed. Caravan G provides systemic control of pests and disease on turfgrass including residential, commercial, golf courses and athletic fields. Insects: White Grubs, Chinch bugs, Ants (excluding Carpenter, Fire, Harvester, and Pharaoh), Craneflies, Billbugs, Japanese beetles, Sod webworms, and others listed on the label. Disease: Anthracnose, Pythium blight, Brown patch, Pythium root rot, Yellow patch, Gray leaf spot, Large patch, Leaf spot, Summer patch, Melting out, Take-all patch, Necrotic ring spot, Zoysia patch, Pink patch, Red thread, and others listed on the label. Great product to cover two problems at once. Headway Fungicide and Meridian Insecticide together cover the major lawn diseases and grubs. Much cheaper than buying separately. Excellent product for that red fungus I have on my Zoysia. Product worked great for the fungus (red thread & brown spot everywhere), as well as the lawn insects. This product really does save you a lot of time providing control for fungus & insects at the same time. Was well-packed & shipping was fast. Very effective against chinch bugs, grubs, and grey spot fungus in St Augustine turf. Great combination product of insecticide and fungicide. I saved time a lot with this.